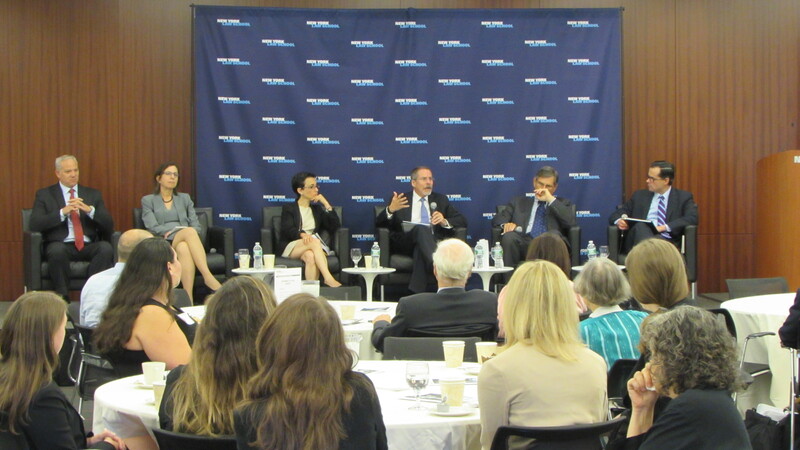 On Friday September 11, 2015, the Center for New York City Law at New York Law School hosted the 128th City Law Breakfast. The speakers were a roundtable of Jeffrey Friedlander, Steven Fishner, Marjorie Landa, Bryan Grimaldi, and Florence Hutner discussing their roles as attorneys for the City on September 11th, 2001 and in the days after. The panel was introduced by introduced by Ross Sandler, Professor of Law and Director of the Center for New York City Law, and moderated by Anthony Crowell, Dean and President of New York Law School. The panel shared their stories of what happened to them at the time of the attacks, as well as addressing the various legal challenges that faced the City in the days thereafter. Steven Fishner discussed expediting death certificates for the victims to allow their families to collect life insurance, and Jeffrey Friedlander recalled having to relocate the Law Department offices from 100 Church Street due to debris from the Twin Towers. The panel closed by taking questions from the capacity audience.